Known as the Cradle of Liberty, Boston is home to top-rated attractions, world-famous museums and pristine natural beauty. From historic and entertaining trolley tours to lush green landscapes at Boston Public Garden, you'll find no shortage of exciting things to do and see in Boston. Plan ahead and purchase your tickets online to make the most of your time in the city. Buy a CityPASS to save up to 46% during your trip to Boston. Avoid lengthy ticket lines while visiting the city's top-rated attractions. Explore hands-on exhibits at the Museum of Science, see incredible marine creatures at the New England Aquarium, take in panoramic views at the Skywalk Observatory, see the renowned collection of masterpieces at the Museum of Fine Arts and choose between two additional Boston attractions. Perfect for weekend getaways or extended vacations, save time and money while getting full access to the best attractions that Boston has to offer. Don't miss out on any of Boston's famous sites. Take a guided tour of the city to learn all about its fascinating history. From entertaining trolley tours to historic pub crawls, you'll see the best of the city without worrying about parking. Climb aboard Old Town Trolley Tours of Boston for a hop-on, hop-off sightseeing adventure. The trolley makes 20 stops at the most popular points of interest throughout the city, including Fenway Park, the Boston Tea Party Ships and Museum, Faneuil Hall and more. You'll also have the option to spread your tour out over 2 days if you need more time to see the sights. Boston's famous 2.5-mile Freedom Trail is truly a walk through history. Along the trail, you'll find highlights such as Boston Common, Old South Meeting House, the Boston Massacre Site, Paul Revere's House, The Old North Church and the USS Constitution, among many other historic places. Learn about the American Revolution and the establishment of a new nation during a guided walking tour of the Freedom Trail. Ready to see the spooky side of Boston's past and present? Step aboard the Trolley of the Doomed on a Ghosts and Gravestones Haunted Tour of Boston. Your 17th century gravedigger guide will tell stories of Boston's most infamous ghosts and supernatural sightings as you visit a number of historic places throughout the city. Gain access to two of the oldest burying grounds in Boston, including Copp's Hill Burying Ground and the Granary Burying Ground. You'll see the final resting places of American heroes such as John Hancock, Paul Revere and Samuel Adams on this frightening, fun and informative tour. See New England's famous whales up close on the New England Aquarium Whale Watching Cruise narrated by professional researchers. On this 3-hour excursion available from March 29th through November 23rd, you'll ride in comfort aboard a high-speed catamaran to witness the power and beauty of New England's whales. The vessel is equipped with outside decks for optimum viewing and a climate-controlled cabin featuring a fully stocked galley. Cruise around Boston by land and water on a famous Boston Duck Tour. Dive into fun aboard a WWII-style amphibious vehicle that takes you from the city streets to the Charles River without missing a beat. Knowledgeable tour guides narrate the tour and offer fascinating insights into Boston's rich history. You'll see many of the most famous landmarks and neighborhoods in the city, including Boston Common, Beacon Hill, the Museum of Science, Trinity Church, the Boston Public Library and much more. Take in awe-inspiring views of the Boston Harbor as you sail on this exciting 2-hour dinner cruise. The voyage takes you as far north as the Mystic River and as far south as Castle Island, so you'll enjoy the best views of Boston from the water. Complete with 3 climate-controlled interior decks, a large outdoor patio and panoramic views of the sunset, you'll feast on a delicious dinner buffet and dance to music by professional DJs. 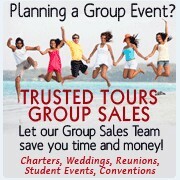 Trusted Tours offers discount tickets for must-see Boston attractions and specialty tours. While you're in the city, shop and dine at Faneuil Hall Marketplace, witness an underwater world at the New England Aquarium, climb aboard authentically restored tall ships and more. Learn about the most popular things to do in Boston. Faneuil Hall Marketplace is home to 49 shops, 18 restaurants and pubs, 44 pushcarts and more. Founded in 1742, the hall is now a hub of Boston shopping and dining. Explore unique shops and eateries while relaxing just steps away from the waterfront. You'll also find street performers and artists filling the cobblestone promenades outside Faneuil Hall. The New England Aquarium houses 3 species of penguins, lionfish, leafy sea dragons, a giant Pacific octopus, Northern fur seals, California sea lions, Atlantic harbor seals and many more fascinating creatures. Stop by the aquarium's touch tank to interact with cownose rays, epaulette sharks and Atlantic rays up close. Visitors also enjoy spotting Myrtle, the 500-pound green sea turtle, in the aquarium's Giant Ocean Tank, where she has lived since 1970. Have a revolutionary experience at the Boston Tea Party Ships and Museum, where you can throw tea overboard on authentically restored tea ships, watch the multi-sensory documentary "Let It Begin Here" and sample pastries at Abigail's Tea Room. Join the Patriots on a 1-hour guided tour of the museum's many interactive exhibits and historic artifacts. Perfect for all ages, a visit to the Boston Tea Party Ships and Museum is one of the top things to do in the city for history buffs. Part of Boston's Emerald Necklace of beautiful public parks, the Boston Public Garden is nestled in the heart of the city adjacent to Boston Common. It has been featured in several famous works of literature, including E.B. White's novel The Trumpet of the Swan and Robert McCloskey's famous children's book Make Way for Ducklings. Take a ride on the garden's swan boats, explore the pristine greenery and relax on sunny days. Enjoy great attractions and a generous savings! The New England Aquarium - Old Town Trolley Package Tickets may be used on the same or separate days. Includes free admission to the Old State House Museum. See the Best of Boston with the Old Town Trolley Tours then walk along the Freedom Trail. Experience American Revolutionary history led by 18th Century Costumed Guides. This package combines the Boston Old Time Trolley along with the New England Aquarium Whale Watch trip. You will see the best of land and sea...and save money too! Our same fantastic Boston tour with "on and off" Old Town Trolley privileges for 2 days! The very best way to see all that Boston has to offer. And also enjoy the Boston Tea Party Ships & Museum in this great value package. From Beacon Hill to the New England Aquarium, the Back Bay to Boston Common, Old Town Trolley is the best way to see Boston. Hop on and Hop off at 18 designated stops. Our same fantastic Boston tour with "on and off" Old Town Trolley privileges for 2 days! The very best way to see all that Boston has to offer. Includes a Free admission to the Old Old State House Museum and Dreamland Wax Museum. This spirited tour will give you a look at the city of Boston's darker side as we share local tales and legends. The 90 minutes journey will take you on a spine tingling trip through Boston's historic burial grounds.! Learn how the historical experiences and important events around December 16th 1773, reinforced the way that the Boston Tea Party changed the lives of Americans forever. Climb aboard historic ships, throw tea into the sea, enjoy a fully narrated tour and more! Save time and money with this exclusive Boston tour package. Includes Free Admission to Old State House Museum. This combo tour presents the events around December 16th 1773. Learn how the Boston Tea Party changed the lives of Americans forever. Climb aboard historic ships, throw tea into the sea, enjoy a fully narrated tour and visit the Old South Meeting House, Where the Boston Tea Party Began! Day and Night, Old Town Trolley has you covered in the Boston Day and Night Old Town Trolley Package. Old Town Trolley is the best way to see Boston. Includes admission to the Ghosts and Gravestones plus admission to the Old State House Museum for FREE. On this combo your will see whales and dolphins on an exciting whale watching cruise. Then go to the New England Aquarium and stand in awe of the four-story, 200,000-gallon Giant Ocean Tank, home to everything from sea turtles to sharks to tropical fish. The '2 Hour Segway Tour of Boston, Charlestown & Cambridge' offers a guided glide to see highlights of the Freedom Trail, the Boston Harbor, Charlestown, The North End, Beacon Hill, Back Bay, and the city of Cambridge. Segway training is provided before tour departs! There are 12 great family attractions in LEGOLAND® Discovery Center Boston. Your admission includes all rides, exhibits and movies. The Discovery Center is a world of color, creativity and fun for children aged 3 to 10, but people of all ages have fun! At Plimoth Plantation, you will experience life as it was like in 1627 New England as well as what we think it means now from a 21st-century perspective. Visit exhibits including the 1627 English Village, Mayflower II and more. Visit the New England Aquarium with its 3 surrounding levels of exhibits, galleries, hands-on tide pools, discovery centers and more, and see an amazing IMAX film at the Simons IMAX Theatre with this combo. It's a must see in Boston for tourists and locals alike. At the Aquarium's Simons IMAX Theatre you won't just watch a film, you'll be there, thanks to amazing IMAX 3D technology. Experience the beautiful and astounding creatures of the deep, in the most cinematic way imaginable, on the largest screen in New England! Old South Meeting House, Where the Boston Tea Party Began! Old South Meeting House, Where the Boston Tea Party Began! is where colonists gathered to challenge British rule in the years leading to the American Revolution. Open daily as a museum and treasured landmark that keeps its revolutionary heritage alive by being an active gathering place. Tour the Museum and relive the powerful story of the Kennedy years. In 3 theaters and 25 dramatic multimedia exhibits, you will enter the recreated world of the Kennedy Presidency for a first-hand experience of John F. Kennedy's life, legacy, and leadership. The Peabody Essex Museum is America's oldest continuously operating museum. The historic houses and gardens, American decorative art and maritime art collections provide an unrivaled spectrum of New England's heritage over 300 years. Explore the church that launched a revolution! Hear the story behind Paul Revere’s ride. Discover Patriots Corner and taste colonial chocolate in the Clough House. See more with a tour of the bell ringing chamber and crypt. Boston's #1 Selfie Museum! Snap selfies with over 100 figures: every US president, celebrities, sport stars and world leaders. Just 100 steps from the Freedom Trail in Boston's City Hall Plaza between the Old State House and Faneuil Hall. With magnificent skyline views, live entertainment, dining and dancing, a Spirit Cruise is an unforgettable experience and the most unique way to celebrate an afternoon on one of America's most celebrated harbors. Catch the Spirit of Boston on it's Harbor Sunset Cruise! Enjoy sunset over the harbor and skyline views from a huge outdoor deck. Savor a wonderful buffet and rock until you dock to your favorite music. A magical setting enhanced by dazzling city sights and harbor lights. An evening filled to the brim with wonderful cuisine, live music and dancing under a canopy of stars. No trip to Boston is complete without a view from the deck of this festive ship. This is the ultimate Boston experience. Climb aboard the Boston Odyssey and enjoy a two-hour escape to signature elegance, with views of Historic Boston Harbor and Boston's famous architecture. Enjoy a lunch buffet and live musical entertainment. Odyssey is one of the largest fine-dining cruise ships on the Boston Harbor. Experience gourmet dining, dancing under the stars and spectacular skyline views of Boston on this three- hour escape. View some of the world's most fascinating creatures on the Boston Whale Watching Cruise. Get the best view of the whales from the decks, as researchers from the Whale Center of New England narrate the tour. With the setting sun as a backdrop, see Boston from the water and learn it's history and lore. A romantic sunset cruise is a wonderful way to end your day. You'll be on hand to witness the USS Constitution's sunset serenade as she fires her cannon and lowers her flag. See Boston from the Water! History, character, sites, stories and more, Boston has it all. The Boston Historic Harbor Sightseeing Cruise is not only fun, but you'll learn a few things too. This is a fully narrated 90-minute tour of Boston's inner and outer harbor. See "Old Ironsides" - USS Constitution up close with Boston Harbor Cruises. A fun, educational 45 minute narrated tour of Boston's most treasured landmark, the USS Constitution, the Naval Museum and the Charlestown Navy Yard. This tour is seasonal and operates from April thru November. Boston's first, fastest and most luxurious Fast Ferry! This summer, make the trip between Boston and Salem in speed and style .This ferry makes it easy to enjoy the restaurants, shopping and historical sites unique to Salem. So whether your vacation lasts a week or just a day, escape with BHC..
Boston's first, fastest and most luxurious Fast Ferry. This summer, make the trip between Boston and Provincetown in speed and style. Forget about Cape traffic and parking hassles and set sail! Boston's first, fastest and most luxurious Fast Ferry. This round-trip ferry makes it easy for everyone to enjoy the restaurants, beaches, shopping and nightlife unique to Provincetown and the outer cape. Walk Into History along the famous red line with an 18th Century Costumed Guides. Hear the tales of the brave men who dared to challenge Britain and helped establish the greatest democracy in the world. See 16 nationally significant historic sites. This signature tour allows you to pedal from the Italian North End and historic Beacon Hill, up to Fenway park, and through modern and dynamic Back Bay. Riders will see parts of Boston off the beaten path and all the best sites of the city. Narrated tour led by friendly and knowledgeable guides. One of the best times to experience the Freedom Trail is during the holidays, when the streets are sparkling and the window displays are enticing. Learn how holiday traditions evolved in Boston and experience highlights of the American Revolution on Boston's Historic Holiday Stroll. See your favorite Boston movies and TV shows come to life. Visit the actual filming locations on this 90 min walking tour. Walk in the same steps as your favorite actors and actresses on this exciting tour! The most filmed part of Boston, The Boston Movie Mile, includes over 30 filming locations. 18th century Costumed Guides will lead you on this Historic Pub Crawl. Visit four of the real headquarters where the courage and inspiration of the American Revolution was brewed - the Boston taverns! Sample contemporary Boston food and brew.